We’re back with another painting tutorial for you wonderful people out there to draw some inspiration from. We’ve included a quick assembly guide with this one so you can all see the process from start to finish! If you’re new to working with resin, check out our previous blog which provide some general advice for the cleaning and assembly of resin miniatures. Once you’ve had a read through that article, continue on to see how to assemble Orly! A resin prototype was used to create this guide, not the final resin production piece. The pieces will be same though! Always dry fit your pieces before trying to glue them, to ensure a good fit. Apologies for the dirty nails, I’ve been busy painting! 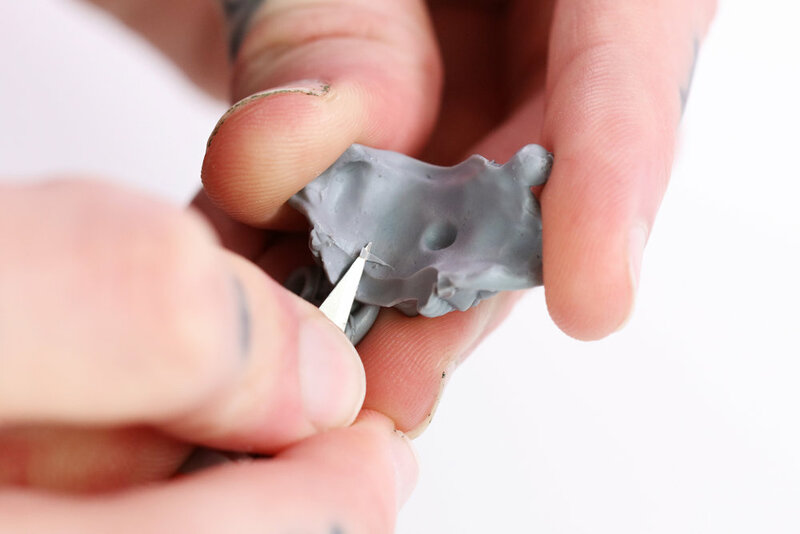 Before you start putting on glue on the pieces of your Orly miniature we recommend going over the miniature with a sharp exacto knife and some files to clean up any excess material left from the casting process. Where possible always cut away from yourself, and take your time. You can always remove more material if needed, but it’s much harder to put it back! If you’re a youngster be sure to get assistance from an adult when handling sharp objects! The sword for the Orly miniature comes on a sprue, you can use either a sharp exacto knife or a pair of clippers to remove the sword off the sprue. With all the pieces of the miniature cleaned up and prepped for assembly it’s time to dry fit the pieces to ensure everything fits as it should. Remember, don’t use any glue when dry fitting! Glue the head to the body. Check for gaps, while the glue is drying and make adjustments as needed. There is a small hole located at the top of the neck on the main body section of the miniature, make sure the small nub on the back of the head sits in this hole. Glue the shell to the body. This step is fairly self explanatory, as long as you took your time during clean up this will fit really snuggly! Glue the arm to the body. Be sure not to use too much glue! Glue the tail to the body. Nearly finished now, just 2 steps to go! Glue the sword to the body. Again, be sure to control the amount of glue you apply! Glue the feet to the base. Just a little dab of glue on each foot should be plenty of glue here! With that complete, we’re all done! With assembly complete, you’re ready to move on to priming your miniature. For some handy tips, you can check out our guide on priming. Once your miniature is primed, you’re ready to move onto the stage where the real fun begins… painting! For this tutorial, Army Painter paints were used. These are nice paints that are widely available online and at your local game store. When using Army Painter be sure to shake them very well, and when you squirt them out onto your pallet mix them with a wet brush before applying them to your model. We recommend their Regimental Brush as well. It is what was used to paint this whole miniature and is a great all-around work horse brush. If you’re brand new to painting and find it all a bit intimidating, we hear you! To achieve a great looking paint job using some fantastic beginner techniques, only follow step 1, step 2, step 3, and step 5. These steps show the basics of blocking in base colors over the entire miniature, adding some washes to these base colors to help bring out the detail of the sculpt, and some finishing touches such as basing your miniature. Most important of all, take your time and have fun with it! Let’s begin! Having a smooth, even base coat to work from is very important part of painting. To achieve this you will want to work from the innermost detail out. You will want to use multiple thin coats of paint to build up a smooth opaque coat of paint. Most colors will take a few thin coats, but some lighter colors like the Greenskin used for the skin will take a few more coats to achieve full coverage. Take your time and make sure to thin and mix your paints well. Allow time for drying between layers so that you do not wipe away a layer you have already applied. Painters Note: Having good light for painting can be very helpful in making sure you are getting good coverage. Desk lamps with daylight bulbs are a good place to start! These washes will help to shade the model and smooth out brush strokes. Mix them well but don’t water them down too much or they can dry leaving a very chalky finish. Apply the washes to the different areas of the model as shown in the list above. If you apply too much, simply rinse your brush, dry it off, and then use it to wick up the excess wash from the model. You will want the wash to pool in the creases and folds of the cloth to help shade the model, but be aware of excess wash pooling toward the bottom of the miniature. The washes will dull down the model quite a bit, so you will need to bring back some shine to the metals, and brighten up some of the other colors. Again work from innermost detail to outermost where possible. For the shell allow some of the under color to show through by using only one thin coat of Rusty Red. When working on the skin you can carefully dry brush the Army Green allowing the raised details to catch most of the paint. To dry brush, use a small older brush with good bounce to it’s bristles. Put some unthinned paint on your brush of choice, then wipe most of your paint off of your brush on a paper towel (hence the term dry brushing). Then, with quick back-and-forth sweeping motions, brush the models skin areas. Once you’re happy with the Army Green, pick out the scales with Scally Green. If you find you have lost some definition of the scales feel free to wash them a little with Flesh Wash to re-establish them. Avoid allowing paint to run into the crevasses by using a brush with less paint on it. If you have made any mistakes, go back and clean them up with the appropriate color. Then if the eyes need it, black them out and/or add separation back between the claws and skin. If you are happy with your model, you can stop here as the next step is optional. However, be sure to paint your base black or base it as you see fit to add that extra finished look. Advice on how to go about doing this can be found in step 5 of this tutorial. Painters Note: Steadying your hands and having your mini on a holder will help greatly with brush control, allowing you to be more accurate with your brush strokes. Painters Note: Having the right amount of paint on your brush is important. A good rule of thumb is to have a damp brush dipped in paint but not fully submerged, and then wiped off on a paper towel or pallet a few times. This will give you good control of where the paint is going and keep the tip of your brush nice and pointed. The model can be edge highlighted now, which is a quick and easy way of highlighting. Make sure to use a damp brush with most of the paint removed. Then very gently and at a crossed angle to the line you are painting brush along the edge. Take your time and steady your hands well, it can take a few strokes of the brush to get the desired effect. The image of Vanessa below does a good job of demonstrating the sort of angle you’re looking for. For the face it can help to turn the model upside down to get an easier angle on its edges. With your model painted, you can choose how you would like them to be based. It’s perfectly fine to leave the base black, but just make sure to clean up the edge and give the base a nice even coat of black paint to really help the model look finished. Alternately you can use sand and glue or pumice gel to give the base some earthy texture and then paint it to match whichever setting you like. You can then add some static grass or grass tufts to bring the base to life. Examples of both can be seen below. If you plan to use this miniature for gaming, it is a good idea to seal it with either a spray-on sealer such as Testor Dullcote or Army Painter Anti-Shine. There are brush-on options available if the idea of using a spray can on your freshly painted miniature is something you’re wary of. In either case, be sure to follow the application instructions provided. Always test your sealer before applying it to your miniature to make sure it cures correctly. We hope you have enjoyed this tutorial and found some useful tips to help you complete your very own Orly miniature. If you find yourself struggling with a technique or are unsure where to start, do some test painting on other miniatures first or even on paper to help with brush control and paint flow. We would love to see your results once your Orly miniatures arrive, so post them up on Twitter using #CrittersPaint!